Remember back when I said I needed to blog about kitchen/dining/hallway wallpaper removal? Well, better late than never! First, let’s take a look back at the dining room soon after we moved in. We put our table there, added some artwork and called it good. Nolan went to the cabin for a guy’s weekend and I went to town on the wallpaper. Below you can see the kitchen wallpaper already down, along with the cabinet hardware and clock (that everyone but me misses). I used the same wallpaper steamer I bought when we took the teddy bear wallpaper down. Unfortunately, the wallpaper in the dining room/living room is more like the wallpaper downstairs. The steamer helped a ton, but it was still a huge sticky mess. I used old tupperware containers to scrape the glue into, but it was too hard to hold the steamer, the scraper and the container, so I just used my pant leg. My pants were about 20 lbs heavier after I was done. With the steamer the glue melts off but if you don’t scrape it off it hardens like a rock and sticks like superglue. I pulled out the trusted Zinsser Gardz again for the wallpapered walls and the red wall required just a little bit of primer. I painted the trim white at the same time. I painted the red wall Behr Creek Bend, same as the main bathroom. The walls in and around the kitchen are Behr Dolphin Fin, same as the master bedroom, because, well, that was the paint I had in the house and was too lazy/anxious to paint to find another color I liked. We also purchased a new dining table and chairs. 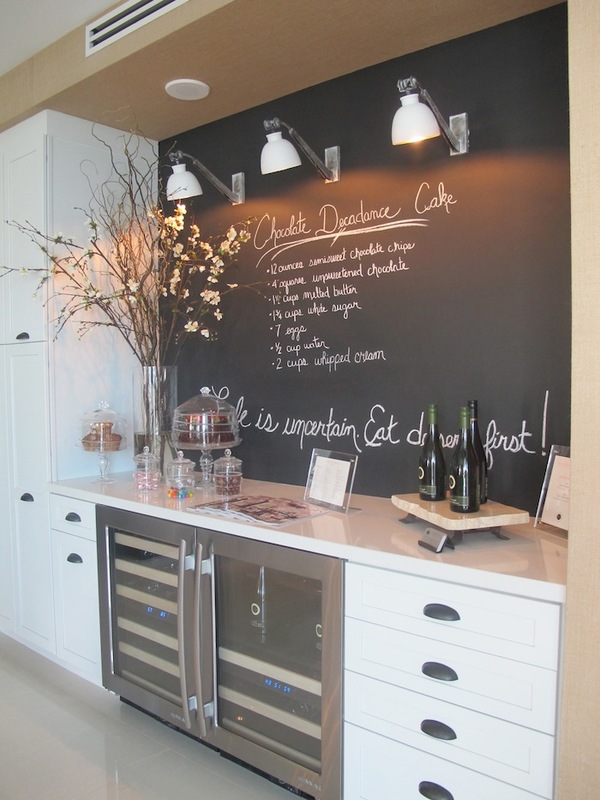 The buffet is a bit small for the wall, but it leaves room on the side for our wine fridge and Sophie’s food/water. Eventually I’d like the entire wall to have built-ins that connect it with the kitchen. Something like this to store my china and glassware, but longer. 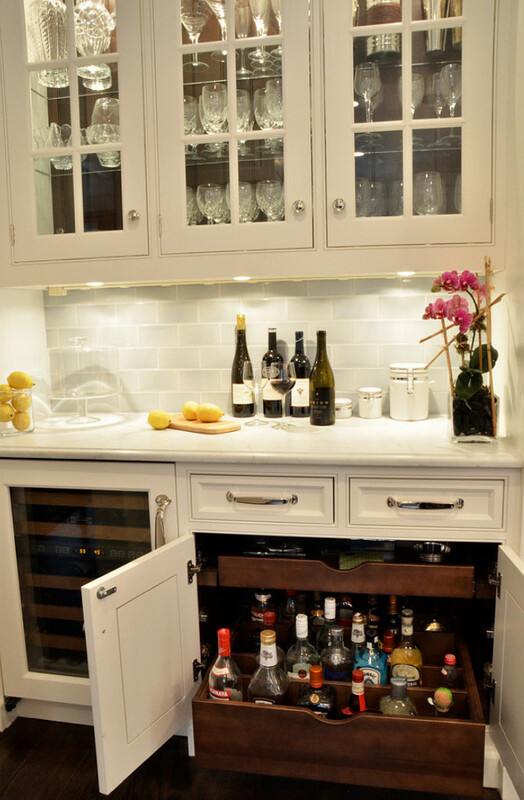 I love the tall pantry cabinets and the double wine fridge here. One can dream, can’t they? I can’t believe you went at wallpaper by yourself! What a DIY-warrior! You did a fantastic job; looks so sophisticated. That bottom picture is so cool, to have lights coming out of chalkboard paint!